If you ask me “what is the Best hunting backpack available on the market is,” I can’t come up with an answer immediately. This is because there are a lot of factors and features that make a great hunting backpack. Sometimes, a backpack which is great for someone is not so great for others due to different needs and preferences. In case you want to look for a suitable hunting backpack, you should consider all of the features in a product first. Then decide which options that suit your likes and requirements the most in this article. At the end of the article, I also review about the best and most popular hunting backpacks for your consideration. The first thing you need to consider is choosing the hunting backpack that can match your purpose and your type of hunting. If you go bow hunting, you should go for one with a bag to hold your bow effectively. On the other hand, if you often use a rifle or short gun, make sure the hunting backpack you choose has the specific bag.This way, you can take the gun or rifle out easily. The size of a hunting backpack ranges from 1000 cubic inches to about 5000 cubic inches. To choose the right size for your hunting backpack, you need to think about your main type of hunting. If you often go big game hunting such as elk hunting, you should choose a big backpack, mainly because your rifle is usually big. On the other hand, if you use short guns and often go small game hunting, you can choose a smaller backpack. Also, the choice of the size should be based on how much equipment, personal items, and food you want to bring for your trip. You have various options when it comes to the fit of the backpack including gender specific, plus size and mini size. It is better to buy a backpack with adjustable shoulder straps and waist belt. Therefore, you can easily make an adjustment, and the backpack can fit your body better. Overall, in term of capacity, there are three main types of designs, all of which have their pros and cons. Traditional: The traditional hunting backpack is simple and lightweight. However, to compensate for the simplicity and weight, you could not carry a lot of gears and equipment. Top Loading: With this design, you can carry a lot of large gears, more than a traditional design but still less than the panel loading. Panel Loading: In case you have to go for multiple day trips, you can consider this design of backpack. A normal panel loading backpack can help you to carry a lot of stuff and organize them neatly. However, it tends to be heavier and more expensive. You can also look for different designs of frame – which are internal frame and external frame. The external frame is more classic and flexible. But sometimes, it can cause squeaky noise. On the other hand, the internal frame can offer you the durability you desire along with the quietness. When picking up a hunting backpack, it is crucial to check the quality of the product. You can easily see if there are stitching lines, both inside and outside the backpack are sturdy enough. There should be no loose thread coming out. Remember to check the shoulder straps as well. Also, check the smoothness of the zippers to see whether they are stiff or not. Warranty is a good signal of the quality of a hunting backpack. Some of the most popular hunting backpack manufacturers offer unconditional lifetime warranties. If a product offers no warranty, it is probably not a high-quality product and will be broken pretty soon. This is the reason why the company is not confident to offer any warranty at all, right? It is also important that you check the policies of the warranty carefully to see what your backpack is covered for. There are other additional features that you should consider to have the best hunting backpack and most enjoyable experience. For example, thick padding will reduce the burden of heavy load on your back and shoulders. Also, well ventilated and breathable padding can help you stay cool and fresh during your hunting trip. If you have to carry your backpack for a long time, the weight is also a very important feature. The quality of the material, as well as the size of the backpack all, contribute to the weight. Also, the ability of the backpack to be waterproof or water resistant is important if you want to keep your stuff dry during the rainy season. Last but not least, a backpack should be quite when you move it around and open the zippers. An external framed backpack would be noisier than an internal framed one. A good hunting backpack should be in camouflage patterns. There are various shades though, and the choice of colors depends much on the area where you go hunting too. In case you go hunting in the forest, you should choose the camouflage pattern with the main shades of green and dark green. On the other hand, if you go hunting in the desert, it is better to choose a backpack with different shades of brown. Here is our list of the best hunting backpacks you can find on the market. Some backpacks are more suitable for big game hunting while some are more suitable for small game, take a look! This bag features the internal frame with top and panel loader. It also has the air track suspension system so that you can easily carry a heavy load without feeling tired and comfortable. It is made of 900 deniers ripstop DWR nylon, and the frame is made from polycarbonate. In the backpack, you can find a hydration bladder; rifle holder and seven pockets. All of these make this backpack one of the best hunting backpacks for your big game hunting session. With the space of 5400 cu in, it is one of the most spacious backpacks you can find on the market. Since it is made with the innovative material, the backpack is very lightweight while it still allows you to carry more weight. It is equipped with the highest possible technologies including the Air Track suspension system and the Ultralight Ripstop fabric. Also, the backpack is padded carefully and thoroughly with very sturdy and carefully stitched threads. The manufacturer offers an unconditional lifetime warranty. The weight belt runs a little bit bigger than other backpacks of the same size. This might be a problem for people with a small waist of around 32 inches. This backpack is designed with top loading and hold-open frame. It features a rifle holder, a hydration pocket and various internal horizontal dividers and ten zippers. The back of the backpack can be adjusted to the range from 17 inches to 23 inches. The pack size is 5250 cu in. Additionally, it is made of charcoal nylon ripstop fabric. It is most suitable when you go elk hunting or big game hunting for several days. This backpack is well made with excellent craftsmanship with solid stitching and virtually no loose threads. Although this product is made with an external frame, it doesn’t cause any squeaky noise that normally comes from external framed backpack. The material is well selected to be of the top notch quality with promised durability. It offers huge space with easy and multiple access to both of the outer and inner compartments. The price of this backpack is very reasonable. With the weight of about 7.5 pounds, this backpack is quite heavier than other backpacks you can find on the market. This backpack has a single sling with built in the quiver for quick access and bow holder. It is made of lightweight ripstop nylon. There is a range finder pocket, a side mounted bow clip and mesh back pads for extra air ventilation and breathability. Besides, the weight of this hunting backpack is around 2lbs. Overall, it is most suitable for any archery hunter. It is also a great option you can consider for your tree stand. This backpack is the lightest among all of the hunting backpacks reviewed on this list. With the streamlined pocket straps and perfect balance, you would be able to carry backpack comfortably throughout your journey. Moreover, with this product, you are free to move your arms for shooting. The material is of high quality to bring a good reinforcement as well as durability for the backpack. It contains 12 compartments so that you can easily divide and organize your stuff inside the backpack. Nevertheless, with the space of 1400 cu in, this archery hunting backpack is quite small, especially the outside pocket is quite small and shallow. Elberstock, like Badlands, Apls Outdoorz, and Tenzing, is one of the most popular and premium brands regarding hunting backpacks. Their products are of high quality, convenient and trendy style with excellent craftsmanship and this product is not different. The design of this hunting backpack is Bat Wing expandable design. The cubic inches of this backpack are 1830. It is made of nylon with the lightweight tubular aluminum frame. It features the Ample FlexChassis™ technology for you to flip forward for seating or cradle loads your strap to the back. This is one of the greatest choices you can consider for bow hunting. Unlike some other backpacks, particularly the Alps OutdoorZ Commander Freighter Frame, this backpack is very lightweight with the weight of only 4.5 pounds. 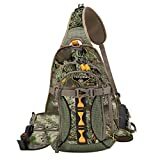 You can use this hunting backpack to carry a compound bow, a short gun, a full-scale hunting rifle, or whichever hunting weapon you prefer to use. The material of this backpack is of high quality with very solid but flexible construction. Thus, it can make you feel comfortable carrying this backpack for a long time with heavy weight. This backpack is more suitable for hunters with a short torso. This is the product of Monkey Paks, featuring the military inspired style with hydration water bladder and multiple pockets inside and outside to organize your belongings. In comparison with other hunting packs, this one is particularly smaller in width and longer in depth. This product is best used for day hunting or short trip. This backpack features the water resistant ability that can last for a long time. 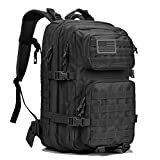 The pockets are of this backpack very large with a lot of space to store your large gear, especially the two side pockets. Also, there are pockets of different sizes so the backpack can organize your equipment accordingly. The strap fasteners of this backpack are not as durable as other parts of the backpack itself. It is smaller in size than other backpacks. With all of the information above, I hope that you would be able to find the best hunting backpack you are searching for. With a thorough research and careful consideration, I am sure that you would finally make the most informed decision and have the backpack that meets all of your needs and preferences. What is the best Deer Feeders? Check my top 3! The experiences and skills I have gained over years up to date is invaluable. http://bravehunters.com is a participant in the Amazon Services LLC Associates Program, an affiliate advertising program designed to provide a means for sites to earn advertising fees by advertising and linking to Amazon.com. Certain content that appears on this website comes from Amazon.com. Brave Hunters Copyright © 2019.